REDONDO BEACH, CA--(Marketwired - Jun 6, 2013) - Michael Fulbright, D.D.S., a Los Angeles cosmetic dentist, recently announced the launch of a new responsive website for his dental practice, which also serves Torrance, Hermosa Beach, and surrounding areas. The new responsive design makes it easy for his current and potential patients to learn more about the wide range of cosmetic, restorative, and general dentistry treatments offered at his practice. The streamlined, user-friendly layout of the site allows easy navigation, no matter what type of device the patient is using to view it, a convenience Dr. Fulbright says is essential for many patients today. The website also helps to boost patient education, providing information about a variety of conditions, encouraging patients to be knowledgeable about treatment options, as well as preventative care. At his practice, the South Bay dentist says he uses the latest technology in order to provide his patients with the highest level of patient care and ensure the best possible results. According to Dr. Fulbright, the advanced equipment helps to make regular dental appointments faster and easier, and dental surgeries can now be performed with less discomfort and shorter recovery times. 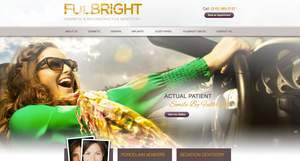 In order to create the new easy-to-use, yet educational website, Dr. Fulbright explains that he chose to partner with Rosemont Media, a San Diego-based dental website design firm. "Many patients are conducting research on their mobile devices in order to find a new dentist, or to find out more about a dental condition they may be experiencing, so it was important for us to have an informative website that is easy to view on any screen," he says. Dr. Michael Fulbright earned his Doctorate in Dental Surgery from the School of Dentistry at the University of Southern California (USC). After earning his D.D.S., Dr. Fulbright continued his education in dentistry through post-graduate training at UCLA in the Advanced Aesthetic Continuum, as well as the prestigious Pacific Implant Institute. Now at his own practice, he continues to keep his skills and expertise current through participating in continued dental education annually. He is a member of the American Dental Association, West Los Angeles Dental Society, American Academy of Cosmetic Dentistry, and a number of other accredited professional boards. He is available for interview upon request. About this company Michael Fulbright, D.D.S.